It is commonly acknowledged that those things which possess the highest beauty present not only an outward attraction but also an inward intelligence. The same should be true of your custom kitchen cabinets. 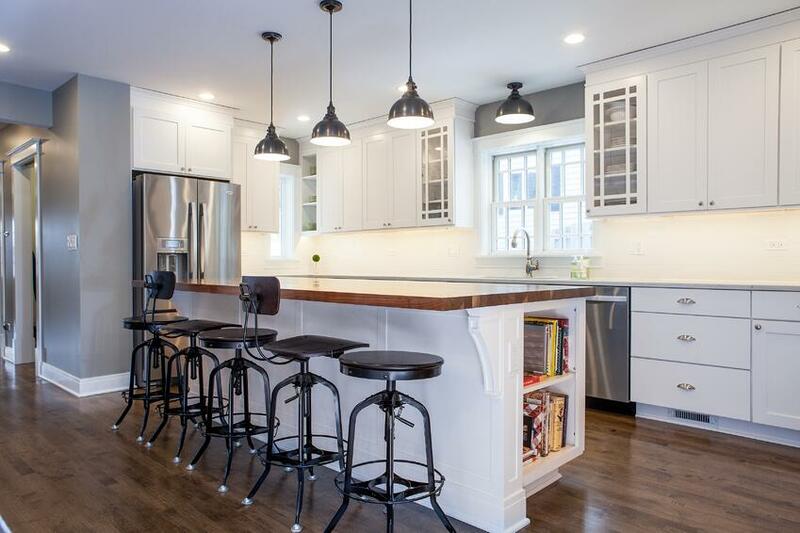 When entertaining kitchen design ideas for your Chicago North Shore area house, raise your standards to encompass both an aesthetic exterior and a high-functioning interior. In this article, we’ll look at both. 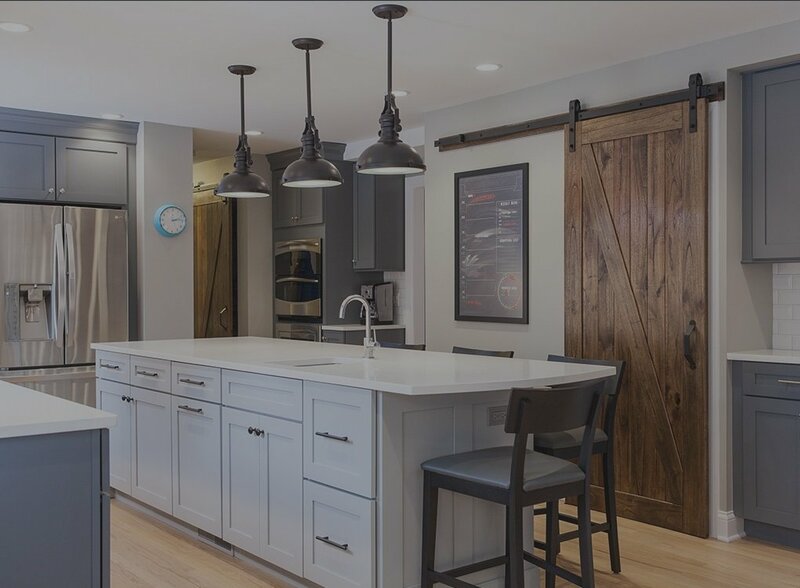 Whether you select warm traditional style woods, sleek urban metals, bright hued paints, or any combination of these materials to define work zones, thereare several ways in which you can make your kitchen cabinetry both appealing and functional. An open and airy look is increasingly popular within home décor movements, and this includes the kitchen as well. For daily plate ware or crystal goblets, consider alternating closed-cabinets with display-oriented open shelving or glass doors options. Functionality isn’t solely an inward element. There are a number of outside-cabinet organizational features that can up both your kitchen functionality and style. Wood or metal spice racks and knife hangers, for instance, can make frequently-used items both accessible and fashionable. 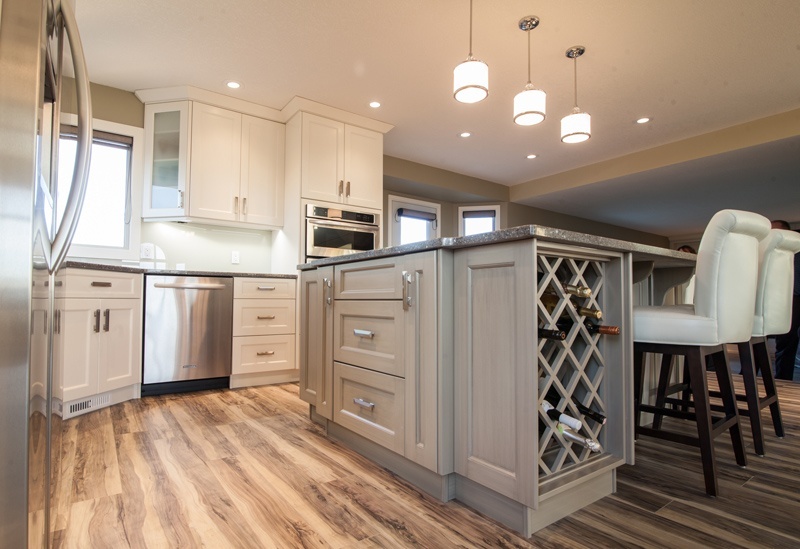 The above picture kitchen remodel by a home renovation company in Edmonton showcases a stunning wine rack at the end of the kitchen island that is sure to make an impression when entertaining guests. Now let’s transition our discussion to look at interior cabinetry options. 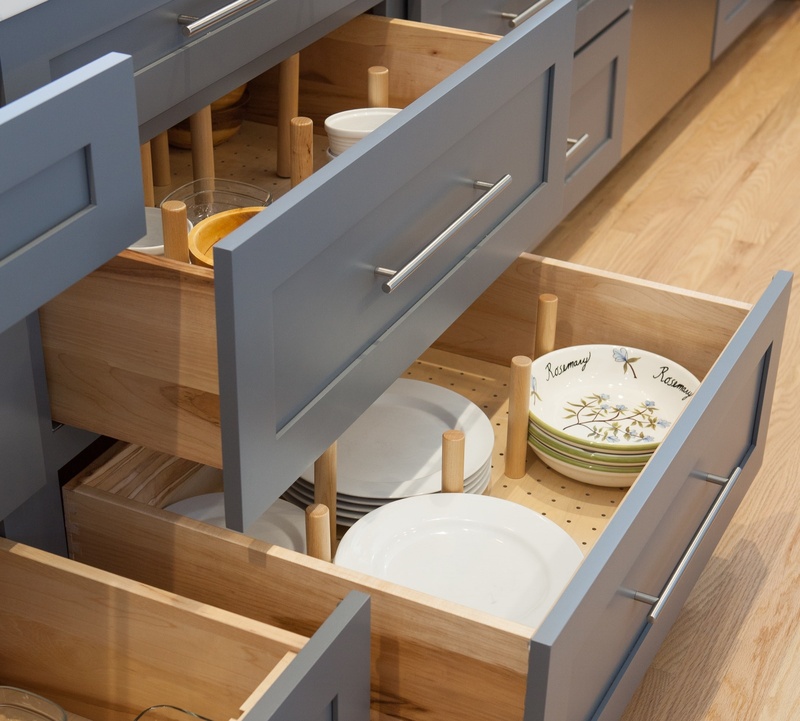 There are a number of utensil or spice drawer organizational dividers on the market that home owners can install into their kitchen cabinet drawers after construction, but why not incorporate these into your original cabinet drawer designs? Eliminate “dead space” by buying drawers that come with dividers already in place so that your fit is perfectly tidy. 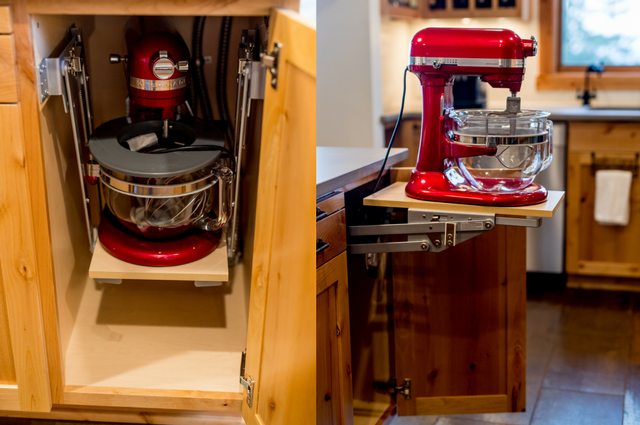 Corner spaces in kitchens are uncomfortably common and notoriously awkward. The good news is that new kitchen design ideas allow these spaces to become not only livable but also desirable. Lazy susans have traditionally been the only option for corner cabinetry, but now swing-out blind corners also address this special dilemma. For upper corner cabinets, consider running your cabinets the full length of one wall and transitioning to open shelving on the adjacent wall. The example above is a perfect example, designed by this kitchen remodeler in Madison, WI, of a modern take on the Lazy Susan. It is perfect for those blind, hard to reach, cabinet corners. If you’re tired of struggling to reach under your sink to access your trash bin, consider a narrow and invisible single bin sliding cabinet pull-out. Or, if you always seem to stack up waste before disposal pick-ups, manage your waste output by purchasing a trash compactor appliance that complements your existing kitchen cabinetry. 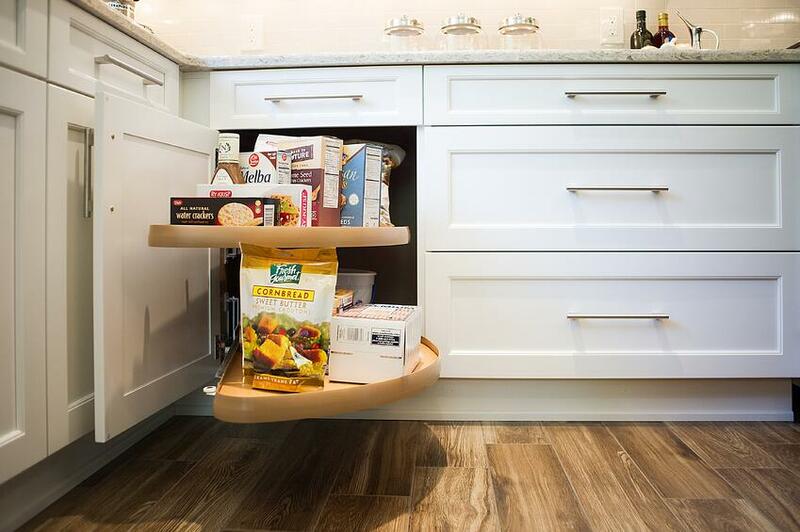 When it comes to pantries, you have almost limitless options. If space allows, walk-in pantries are always a highly desired trend. Everything from old-fashioned butler’s pantries, complete with decorative cabinetry, to walk-in pantries with minimalist metal shelving are rising in popularity. If your space doesn’t allow this elaborate addition, however, there are several in-cabinet pantry work-around options available. Finally, if space and budget allow, allow yourself some elegant embellishments like wine racks, pull-out cutting boards, tip-out trays, and under-cabinet goblet racks or mug hooks. 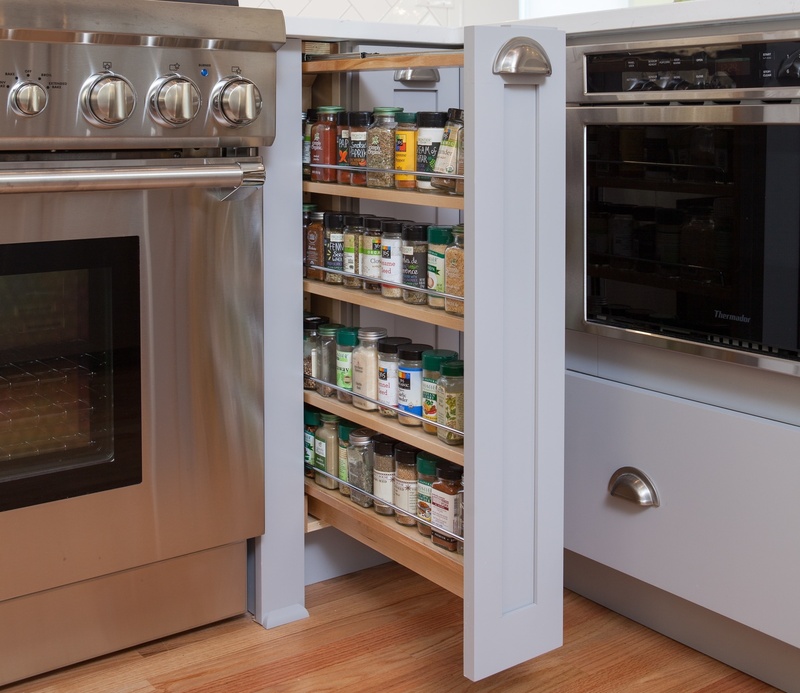 The example above, designed by a Portland remodeling company, is a great way to store those must-have, big, bulky kitchen appliances. When it is not being used it is out of site, out of mind. However, when needed it is easily accessible. Regardless of your style, space, and budget, there are numerous and inspiring kitchen cabinet options available to make your new kitchen remodel beautiful on both the outside and the inside.